The minutes before the start of a U.S. Supreme Court hearing on an issue that had bounced from federal court to federal court for six years presumably would be a nerve-wracking time for those who had been involved from the beginning. But one year ago today, the contingent of “Jersey boys” who attended the New Jersey sports betting hearing were anything but nervous. Instead, for former state Sen. Ray Lesniak — the key player in the Legislature in advancing the cause — a memory that stands out now, one year later, is one of amusement. He recalls that Gov. 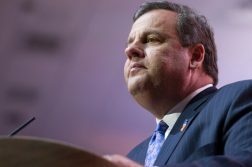 Chris Christie had told him that he needed to be sworn in before the hearing began. That was worth a chuckle to Lesniak because he, lobbyist Bill Pascrell III, and Monmouth Park operator Dennis Drazin, all of whom were in attendance, are attorneys who already were qualified on that front. Yet Christie, the former U.S. Attorney for the state of New Jersey, somehow was not. That morning, the Jersey boys were more focused on that amusing little quirk than on how the hearing would go. That tells you a lot about their state of mind. “We knew we were on the verge of victory,” recalled Lesniak. Drazin said he accompanied Ron Riccio, who represented the state thoroughbred horsemen in the case, on a train ride to Washington, D.C. the day before. This was no false bravado. Not only does the Court favor the side whose appeal gets accepted a majority of the time, but the Jersey crew had an extra reason to feel assured. In the previous 20 cases sent to the Solicitor General, sometimes called “The 10th Justice,” there had been 10 recommendations to take cases and 10 suggestions to pass. The Court accepted all 20 of those conclusions. Yet a month after this recommendation, the Court decided to take the case anyway. “When they decided to take the case anyway, we knew we were in,” Lesniak said. It’s often said by attorneys that laymen can err by assuming that the line of questioning by judges indicates either support or resistance; often they are simply probing a particular side. One of the prime points of the state attorneys as well as the horsemen was that in order to try to avoid losing the case on grounds of Congress unconstitutionally “commandeering” states into enforcing a federal ban, federal attorneys had noted that New Jersey could, if it chose, eliminate all of its sports betting laws. “When I saw the Solicitor General being grilled about the idea of 12-year-olds being able to walk up to betting windows, I saw scowls on the faces of some of the judges,” Drazin said. Lesniak recalled that renowned attorney Ted Olson clearly was “at the top of his game” in handling his own grilling by the Justices. For Pascrell, a subtle detail involving two justices further reinforced his confidence. “I saw that Clarence Thomas was feeding Justice Stephen Breyer notes. I leaned over to [fellow attorney]Jeff Ifrah and said, ‘We’ve got Breyer in our corner, because there’s no way he’s taking Thomas’ notes otherwise,'” Pascrell said. The Jersey boys — along with state Senate President Stephen Sweeney — then left the courtroom to meet the press outside. Drazin said he recalls walking out of the courthouse and being congratulated by an attorney from the other side of the aisle. Then Drazin immediately did two things. First, he began a series of comments that, while he didn’t quite want to match Joe Namath’s guarantee that the New York Jets would win the 1969 Super Bowl, went right to the edge of that line in predicting the outcome. 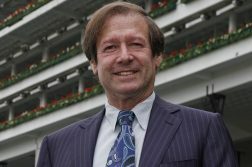 Second, Drazin quickly stepped up renovations of the William Hill Sportsbook at his track — a deal that he and William Hill US CEO Joe Asher reached more than five years earlier, so confident were they that Nevada’s decades-long near-total monopoly on sports betting was doomed. Lesniak, surprisingly, said yesterday that he had not noticed that the anniversary was at hand. But Pascrell said he was “very aware,” adding that two other dates — May 14, the date of the ruling, and June 14, when the first bet was taken at Monmouth Park — also remain etched in his brain. As for Lesniak, June 14 was good to him: He made the first winning bet at the track that day, risking $50 on France at 11-2 odds to win the World Cup. Just call the correct World Cup pick and the favorable Supreme Court ruling Lesniak’s “daily double” of 2018.